Shawl, Nisi. 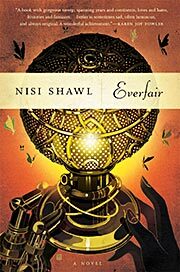 Everfair: A Novel . Tor 2016. What if: Industrialism reached central Africa earlier via a "refuge" created by the Fabian society to aid natives fleeing Belgian colonialism and atrocities. Series note: A sequence of one published novel and three short stories, with additional works expected. Summary: Relates the founding of the nation of Everfair in central Africa by a diverse cast of characters, and also the strife that follows two decades later when a decision is made on a stance in Europe's Great War. Series note: A novel in the Everfair sequence. Awards: Nominee: 2016 Nebula for best novel. Series note: An Everfair short story. Published: In Nightmare #54 (March 2017); and The Best American Science Fiction and Fantasy 2017 (ed. John Joseph Adams), Mariner 2017 (0544973984BUY). Published: In Clockwork Cairo: Steampunk Tales of Egypt (ed. Matthew Bright), Twopenny Press 2017 (1527207773BUY). Awards: Finalist: 2017 Sidewise Award for best short-form alternate history. Shawl, Nisi. "The Colors of Money"
Published: In Sunvault: Stories of Solarpunk and Eco-Speculation (eds. Phoebe Wagner and Bronteë Christopher Wieland) Upper Rubber Boot Books 2017 (193779475XBUY). Series note: Sequel to Everfair .